need help: 3 litre SC engine - should I go for carbs, efi or whatever? What would be the best option, not the most expensive one? rebuild engine, SSI, lighter flywheel ..
is there a comparison somewhere? thanks! I'm interested in this question as well. Have a 3.0L SC and thinking either rebuild to something with more displacement and power ~300+ hp or just swap the engine to a 964 3.6L and start from there or be happy with the ~250hp which will probably feel more than adequate in my 75 911S. regarding the fact, that to nicely tune up a 3.0 you have to split it (for e.g. S-cams, JE-pistons, 993-pump, etc. ), either if it's a Max&Moritz upgrade oder bore-up to a 3.2... this cost money. And as far as I know it cost way more money than to swap for a larger/later engine. 964 cams, SSI exhaust, remove some weight. how fast do you want to go? A typical rebuild with some hot rod upgrades will cost about $10 -$12,000 in parts plus labor. A rebuild done at a good shop will be about $20 - $25K out the door. There are some less expensive things that can be done. Change over to the SSI exhausts for about $2K. Replace the clutch cover with the aluminum one for lower weight and faster revs, about $1K. Change camshafts to 964 cams for a couple of thousand dollars. Have an expert go thru the CIS and make certain it is working "just right", a few hundred dollars. Basic tune up, distributor cap, rotor, plug wires and plugs, again, a couple hundred dollars. If your engine doesn't have any broken cylinder head studs or weak cylinder compression and has good oil pressure, I would leave it alone. Drive it long enough and some or all of the above mentioned problems will show up. That will be the time for a major rebuild. In the end, it is your car and money, make it just the way you want it to be! Happy motoring. I did SSI and weight reduction. engine is sound and trans rebuilt. I read about a + of 40hp (SSI, 964 cams 20/21 and 9,3/9,8 pistons)... true? Last edited by Flojo; 08-31-2018 at 04:44 AM..
Hi, I have a ‘74 with an ‘82 3.0. First take the weight out. Second, if motor is strong, get ITB’s, modern ECU system, exhaust. Third, take the rest of your money and spend it on other parts of the car or better yet, by some more toys. Light flywheel is for racing. Not recommended for everyday driving. Wouldn't this also require another cost item to get all this work work properly, not just the adding parts and rebuilding ? What compression would you be going for to hit 300 hp, that seems like a very difficult number to hit. Not true. It's just something that people repeat because they heard it one time. I have lightened flywheel and clutch in both of my cars. They work just fine, you don't even notice the difference taking off from a stop. You do notice the engine revs quicker. And I think you could do the Triumph ITB for a little more than the Carbs with better performance when done. 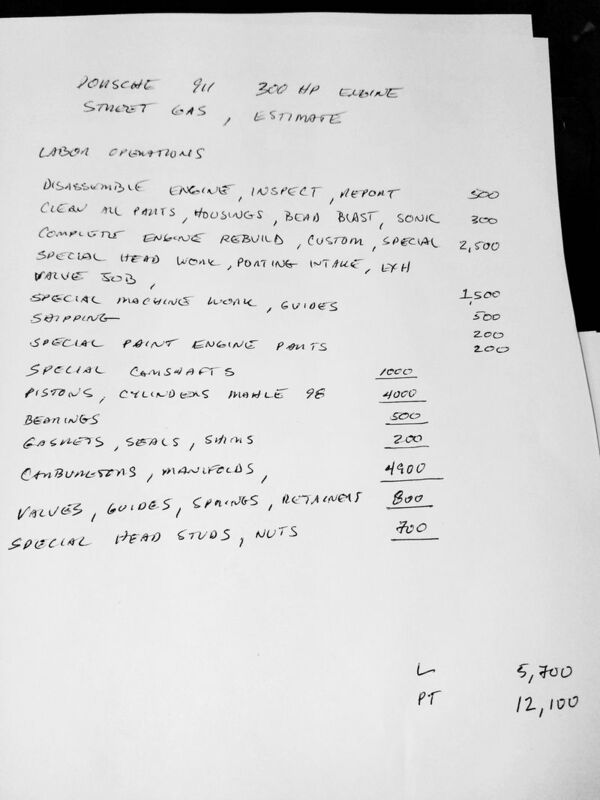 My mechanic has given me this estimate of what it would look like to do a 3.0L rebuild with upgrades to get over 300hp. I am not convinced that build sheet reflects 300 hp. The 74 RSR was 226 and the 84 SCRS was 247 probably using racing gas. In the countless hours burned on this forum, I have not seen normally aspirated 3.0 dyno graphs that demonstrate 300hp. Guessing it's been done but you would really have to have a screaming spinner that would require special rods and retainers on top of the other goodies. Also, a high performance oil pump and other oiling tricks. If I am full of wind and you can get 300hp, I don't think you would like it. Here is my SC engine entirely rebuilt into a 3.2 short stroke, new everything, upgraded rods, valve train etc. 10.5:1, twin plug, and high butterfly intake with coil on plug EFI. No dyno yet, as it is just being completed. Cost? Don't expect $25k to cover it. What concerns me about the estimate I've been given is the use of the words 'custom' and 'special' numerous times without a good explanation of what that means. The only thing that is detailed extremely clearly is the amount of $$ I'll be shelling out. I will be requesting a lot more detail before signing on to the build. [QUOTE=1979-930;10163334]Not true. It's just something that people repeat because they heard it one time. Please don’t assume that I’m just repeating something. Be careful, because once you see half an estimate like this one, you'll give the go ahead to tear the motor apart...then you're committed, and when the finished product has a $35k price tag you're not going to be too happy. Last edited by 911SauCy; 08-31-2018 at 06:34 AM..
That is a nice looking engine! Where did you have it built? Until you own and drive a car with a lightened flywheel; You are just repeating something. That write up is a joke. But it's on the internet, so it must be fact. Rasant Products in SoCal built the engine. Andrew is very highly respected builder and designer of engine management systems. 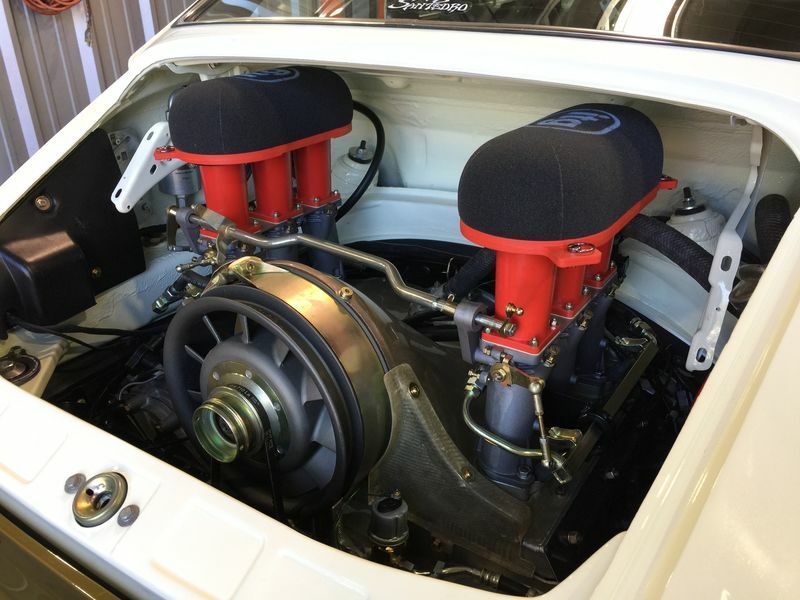 The intake system was put together by Marc Zurlinden at Revival Road in Monterey. He and Andrew worked closely together to create the completed engine.